Bold flavors put beer on the back burner at this new West 7th eatery. The BBQ Slaw Chicken Sandwich packs a nice kick. As the name implies, the recently opened Brewsters seems to be focused on beer, from the 60 craft drafts on tap to the space’s bottle-and-keg-centric décor. 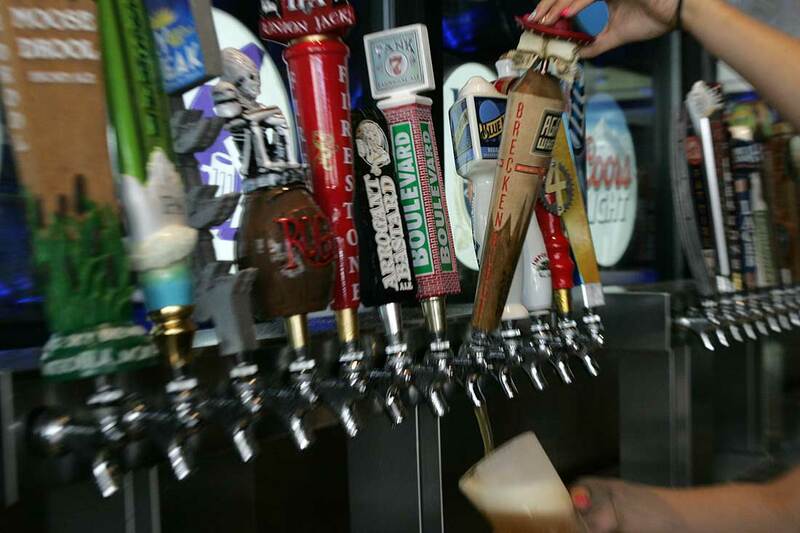 In truth, beer is only half the menu. But with paper towels at each table spun from decorative tap handles and a stack of kegs forming the back wall of the bar, the emphasis on brew is beautifully overwhelming. Seriously, Brewsters’ ambience is one of its best features. Ten large TVs hang at strategic spots along the walls but are never distracting, and while the vibe definitely maintains the “urban retail loft” scheme so popular among West 7th Street spots, Brewsters is its own thing. I was particularly captivated by the walls forming the southwest corner: dark wood panels drilled with a grid of holes filled with empty beer bottles, their bottoms facing outward and illuminated from behind, producing a warm, golden glow, like monoliths of yellow stoplights advising you not so much to slow down as to take it easy. Beer is awesome and all, but since man — allegedly — cannot live on beer alone, Brewsters offers food, chiefly of the burger variety. 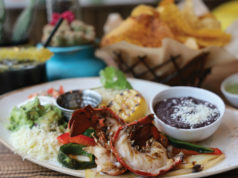 The picky and unadventurous can opt for a regular ol’ cheeseburger, but the rest of us can delve into the specialties. Some, like the mushroom-Swiss and bacon-and-cheddar options, are pretty common, but then there’s stuff like the Big Kahuna (topped with provolone, lettuce, onion, tomato, grilled pineapple, and potato chips) that will likely draw gotta-try-’em-all gourmands in droves. 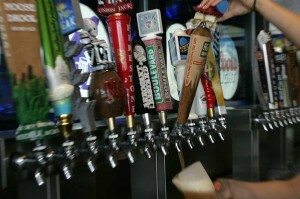 There are dozens of craft beer taps at Brewsters. Like the grilled steak of its namesake sandwich, the Philly burger came covered in a gooey cap of melted provolone slathered in a savory mix of sautéed onions and red and green peppers. While I don’t think the burger really replicated the flavor profile of a cheeseteak –– where’s the melted Cheez Whiz, yo? –– it still was enjoyable. The closer I got to the middle, the more I could taste the seasoning in the patty, meaning that third-to-last bite (because the last two were just an exercise in completism) was heavenly. While the Philly might have been spicy, the Torch was like a napalm strike, even without any peppers hotter than a jalapeño. By the last bite, my hair was damp with sweat. An incendiary yet mildly sweet jalapeño jam combined with spicy pickles, pepper jack cheese, and the patty’s own piquant zing to form a diabolically delicious four-alarm blaze on my tongue. Then there was the BBQ slaw chicken sandwich. While not as fiery as the Torch, it packed a nice kick, courtesy of the tangy pickled relish and ’cue sauce. The bird was tender and peppery, and the slaw, thick with big chunks of cabbage, added a creamy, crunchy texture to a sandwich that normally turns a bun into a soggy mess. The homemade chili was less impressive. Infused with bock beer and Colombian coffee, its subtle flavors were unfortunately subsumed by a general saltiness. Maybe it was one particular batch. I found that stirring it opened up the coffee notes a little, but the dish still tasted like it needed some tinkering. 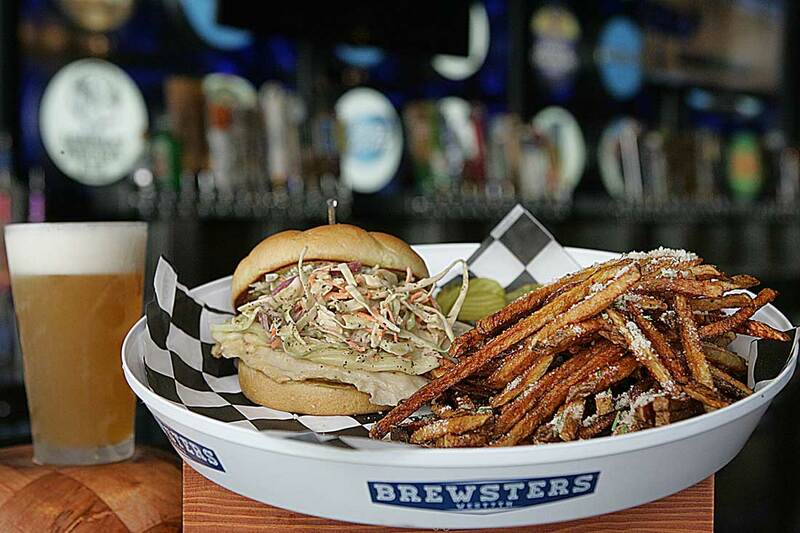 Brewsters also offers a couple of salads, fresh-cut fries and chips, and an ice cream float made from Abita root beer. I had a glass sans ice cream to wash down the chicken sammy. It was actually a better fit than the Rabbit Hole Rapture Fusion Brown Ale I’d started out with. 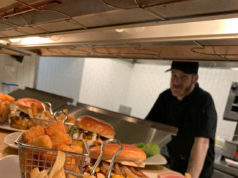 West 7th’s dining scene continues to teem with creative takes on classic comforts, and Brewsters’ burgers are no slouch. The place also is rolling out an expanded menu that will include appetizers such as wings and spring rolls. 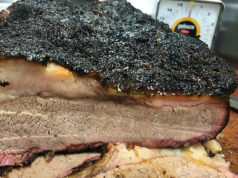 With its huge beer selection and bold, mostly meat-tastic flavors, Brewsters is one crowd worth joining. Good thing the room’s big. 2837 Crocket St, FW. 817-887-9233. 11am-12am Sun, 11am-2am Mon-Sat. Beer, liquor. MasterCard, Visa accepted.